If you can’t get here to the Smoky Mountains, you can mine King Solomon’s Treasure at home! We can’t ship you the chest itself, but we can send you the King Solomon treasure— an incredible 24 gallons of ultra concentrated gem dirt, with more than a QUARTER MILLION carats of natural uncut gems. When you mine this trove you’ll find thousands of stones in this native dirt that comes right off our mountain. You might find Indian artifacts and some gold, too! Your King Solomon Treasure Trove will be shipped to you in 12 boxes, each box containing more than 20,000 carats of gems—that’s a huge amount of gems and a tiny bit of dirt! You can mine each box as it is and enjoy weeks of mining, or for a spectacular gem mining party you can add more dirt from your home improvement store. The King Solomon Trove will provide a wealth of treasure for up to 250 miners—what a party! And the King Solomon Trove makes fabulous gifts—with 12 boxes of treasure, you can mine some of it yourself and share with friends and family too! For easy gift giving, each box comes with full instructions on mining your gems including how to set up your own flume for a gem mining party, adding dirt for extra mining fun, how to recognize gems, and ways to use the gems you find. Each box also includes a Gem Identification Card and a genuine sample ruby and sapphire to help with identification. One box—just one twelfth of the King Solomon Treasure Trove–will provide days of mining fun for a family or will stock a gem mining party with plenty of gems for 15-20 miners. WE GUARANTEE YOU WILL NOT FIND A MINING EXPERIENCE LIKE THIS ANYWHERE ELSE IN THE WORLD. 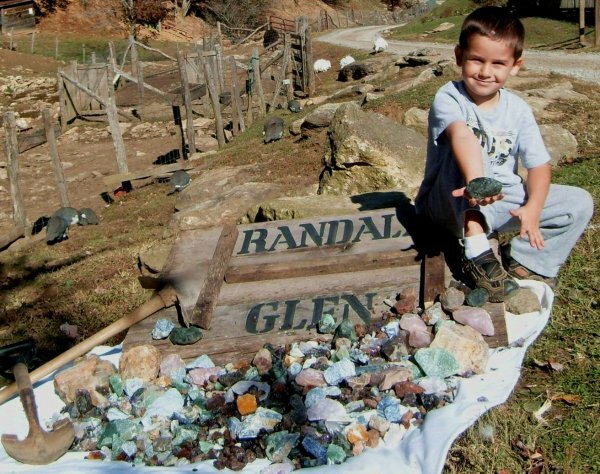 ← Randall Glen is simply a cut of heaven.